Altman Weil Flash Survey: Has the era of data driven pricing arrived? Last week saw the publication of Altman Weil’s 2016 Law Firms in Transition Survey. 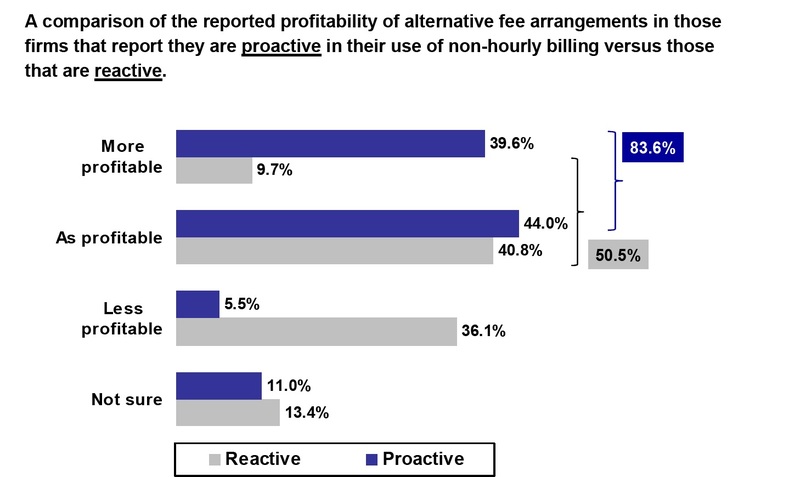 Now in its eighth year, this survey continues to be a good indicator of the market forces law firms are facing and in recent years it has been a good indicator of the fee pressure clients are putting on firms. 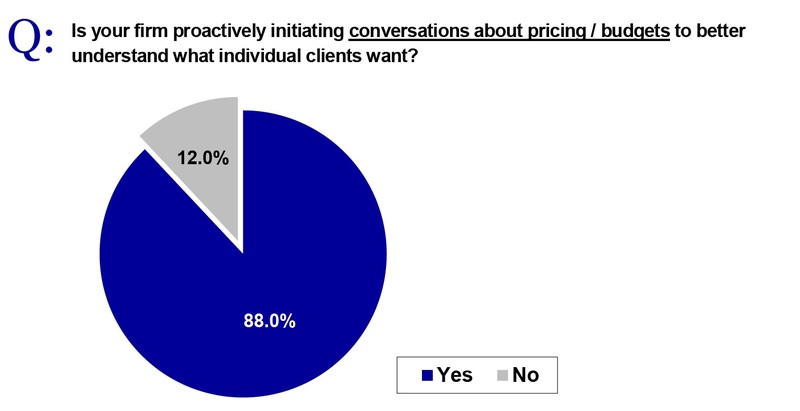 So, how have firms been tracking when it comes to pricing pressure issues? At first blush – well. 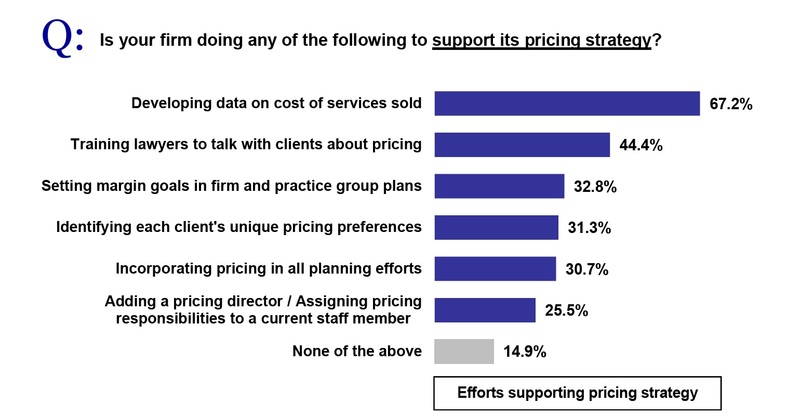 When asked: “Is your firm doing any of the following to support its pricing strategy?“, “Developing data on cost of service sold” and “Training lawyers to talk with clients about pricing” rank head and shoulders (in first and second spot) above everything else. 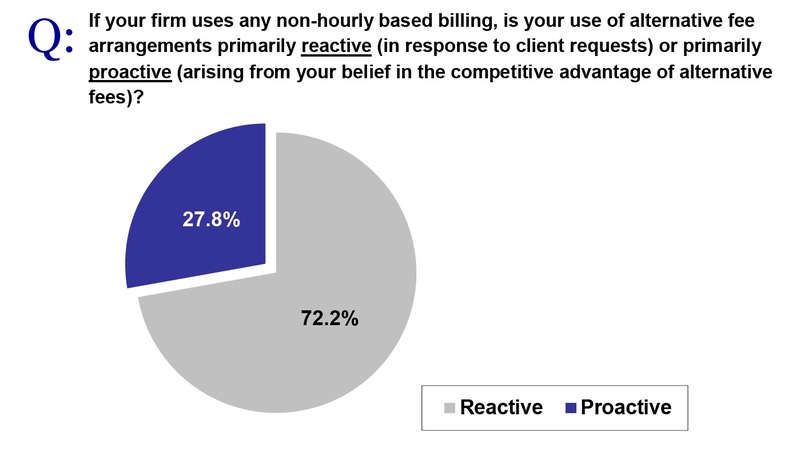 So, almost half (44%) of law firms are now training lawyers to have the pricing conversation with their clients, a whopping 88% of firms are proactively initiating that conversation – and yet three-quarters (72.2%) of firms only make use of non-hourly based billing methods in response to a client request. Am I the only one who finds that incredible? But really, why does it even matter? There’s a clear lesson here for anyone that’s willing to listen to it: if you want your firm to be more profitable, be on the front foot when it comes to opportunities to provide alternative fee arrangements. Which, if you believe, suggests that around half of all law firm partners are not even aware of the challenges their firms face! ← What do clients value most when dealing with their lawyers? Richard I could not agree with you more. As you know I am in the US at the moment. Among other things I was at LMAP3 in Chicago last week and currently in LA at ALA.The “P” word is talked about more and more and I reckon nearly 100 people at LMA P3 had name badges with “Pricing” in their title.Overwhelmingly though while AFA’s are on the increase there is a very liberal interpretation of AFA’s here to include discounts,capped fees, collars and blended rates-all of which are really billable hours in drag. Apart from some notable exceptions, time spent is still the measurement of value in the main reinforced internally by the same old measurement and rewards. Granted there is more understanding of having to be better with estimates and budgetting and incremental improvements being made to the current outdated business model of leveraging people x time x hourly rates, but, again with a few notable exceptions,little evidence of a paradigm shift to other better business & pricing models. Yes, discounts are mentioned in the Survey but I’m rather hoping that if I ignore any reference to them as being “Alternative Fee Arrangements” they’ll go away! Looking forward to your return and a coffee chat to put the world to right.